The Nissan Cube is exactly what its name is- a 4 wheel box. While it shares many characteristics with the Scion XV, it is on its own a great people mover that is perfect for urban environments. The Nissan Cube can easily seat five people and some room for cargo and while the cube is not an SUV, it is very affordable and fuel efficient. The Nissan Cube has been sold for almost 10 years in Japan and it is finally crossing the ocean to America as demand for low cost, fuel efficient urban vehicles is growing. It will be no surprise to see this vehicle become quite popular among the young and techno savvy. The Nissan Cube is not a powerful vehicle, but for what it does it uses its power quite wisely. Under the hood you will find that the Nissan Cube offers a 1.8 liter inline 4 engine which produces a decent 122 horsepower. With front wheel drive and the option of either a 6 speed manual transmission or a CVT automatic transmission the Cube is peppy enough for most city streets. Inside the Cube, you will find a wealth of features that are perfect for most teenage drivers and college students. For parents out there, you will be pleased to know that the Cube offers plenty of great safety features including traction control, airbags and stability control. Also, fuel efficiency is quite good for this people mover, it delivers a respectable 30 mpg on the highway. As for price, this vehicle fits practically everyone’s budget with a base price of only $13K. 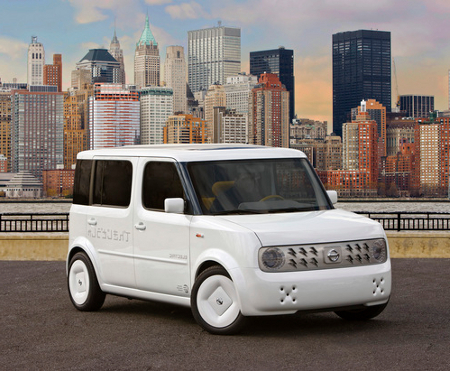 Expect the Nissan Cube to go on sale in the spring of 2009.